A catio – or “cat patio” – is an outdoor enclosure that keeps cats and wildlife safe. Catios offer cats healthy exercise time as well as safety from outdoor hazards like cars, predators and poisons. It’s a win-win! Catios come in many forms. DIY, store bought or custom built, window size to yard size, frugal and fun to fancy with flair! Furnish it creatively with old tree stumps and perches for climbing and scratching. Put your green thumb to work by adding cat-friendly plants. The possibilities are endless! Need some ideas for your own catio? The digital Portland Catio Tour guidebooks are available for each of the past six year’s tours and an Anniversary version capturing all of the catios from the first five years of our event. Get yours! 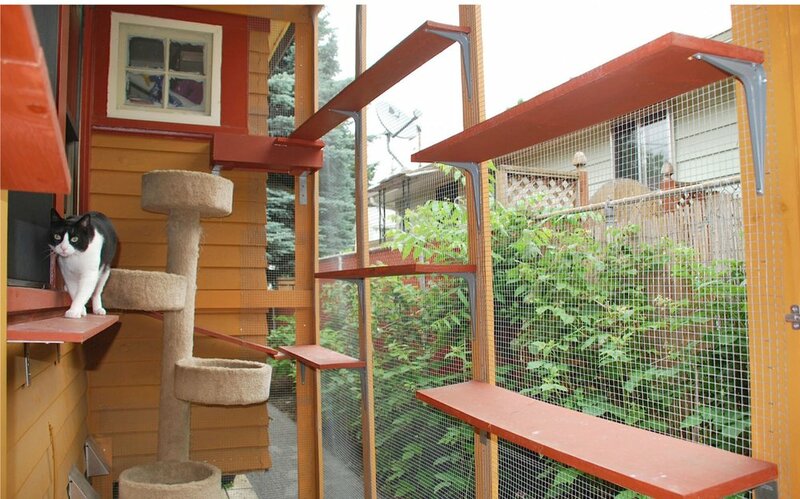 More resources can be found on our Catio Construction Resources page, we're always posting catio ideas and all things cat on Facebook, and be sure to attend our Annual Portland Catio Tour! Cat + Patio = Catio! What some people don’t realize is the positive impact catios can have and how simply they can be made! The benefits of catios are nearly endless and run the gamut from prevention to enrichment. Let’s start with prevention and welfare. Kitty is vulnerable to many hazards when unsupervised outdoors. Cat fights can lead to diseases. These include feline leukemia, feline AIDS, IP (feline infectious peritonitis), feline distemper, and upper respiratory infections. Save yourself the vet bills and ensure your cat's health. It goes without saying that cars are a great danger in and of themselves. Add in ‘distracted driving’ and the fact that indoor/outdoor cats have an average range of several city blocks and you have an unpredictable, dangerous, and easily preventable mix. Injury or worse can come from fighting with raccoons, hawks, and of course, our flourishing coyote community! Mice & rats are often the target of pest control. Our kitties are likely smart enough to not digest the poisons set in traps in alleyways, however, the poisons are often designed to ensure the rodent brings their fate back to the nest. This is where the danger for our kitties persists. Fresh air! Nature’s beauty! A kitty hike or, more likely, a catnap in the sun! We relish the opportunity to relax outside and so do our cats. Catios allow for the expansion of an indoor cat’s world to include experiencing the full spectrum of the change of seasons: sights, smells, feels! Kitty will love you forever. For an indoor/outdoor cat or former feral, the catio is a happy middle ground in providing the outdoor living they may desire in a worry free environment. More than 40% of the 3,000 animals brought to the Audubon Society of Portland’s Wildlife Care Center receive their wounds from cats and of those wounded, 16% survive. Portland is a natural habitat for a menagerie of rodents & birds – migratory and resident. We have endangered species, threatened species, and a steep decline in general bird population. When a safe outdoor enclosure is provided, you’re doing *so* much more than letting kitty get some fresh air! Not only are you spoiling kitty a little, but you’re providing them with a safer life and doing your part for the welfare of our remarkable local wildlife. What kind of Cats Would Benefit from a Catio? Any other reasons I should want one? What if I’m not very handy at building things? There are many online videos demonstrating DIY catios, but if you're the kind of person that doesn't own a hammer there are options! Pre-built, store-bought window units and portable structures are available in stores and online through various outlets. There are several handymen and builders in the Portland area who have been building catios, too! Catios can be simple or elaborate; inexpensive or extreme. They have the common goal of keeping a cat safe while allowing outside time, but otherwise come in many different forms. Consider these design ideas then see below for a list of links to resources. We do not recommend any particular style or brand but hope to make it easier to keep Cats Safe at Home™! Cat-only catios can be fairly inexpensive to build, can be small, and can be built in an otherwise unused space. 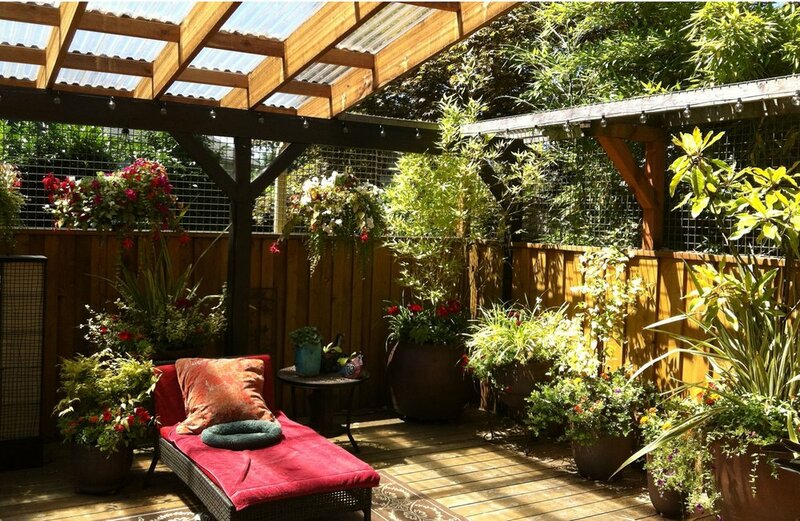 Cat and human shared catios can be transformed from an existing patio just by enclosing it with screen or wire or can be a new addition to your home. This option can also provide a great shaded, bug-free setting for people. Construction can be pre-made kits or fencing, DIY, or built by a hired handyman or contractor. Catio access can be through a window, door, or wall cut, and either direct or through a tunnel to another location (or add the tunnel just for fun!). You can also carry kitty to a free-standing feature. Cool features are limited only by space, weather, safety concerns, and creativity! Consider ramps, cat trees, and boulders for climbing; driftwood and posts for scratching; cat-safe plants for shade and catnip for enjoyment; and fountains and perches for relaxation. Don’t forget lounge chairs for humans to relax with their favorite felines! A starter kit for your Catio building adventure! Catios can be simple or elaborate; inexpensive or extreme. They have the common goal of keeping your cat safe while allowing outside time. We’ve gathered a list of resources for you to get started. We do not recommend any particular style or brand but hope to make it easier to keep Cats Safe at Home™! When you call these providers, be sure to mention the Portland Catio Tour/Cats Safe at Home! PetDoors.com: Wide variety of cat-specific doors and flaps for any entry type you can think of: screen, glass, walls, sliding doors - you name it! We're grateful that PetDoors supports our mission through their Flaps for Fido program. With your purchase, when you select Cats Safe at Home you receive a 10% discount, and PetDoors.com will donate 10% to our mission. 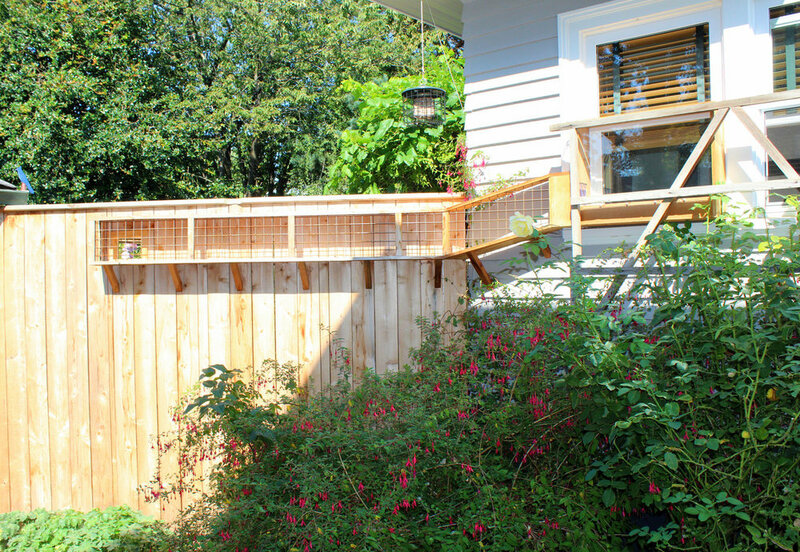 Easy Pet Fence: The Kitty Corral Cat Fence from EasyPetFence.com is DIY cat fencing available in heights 6 and 7.5’ and offers superior protection against external predators while providing safe, easy outdoor time. We're grateful that EasyPetFence supports our mission! My Outdoor Plans: Free step-by-step, totally DIY, catio plans. Includes tools and supply lists. 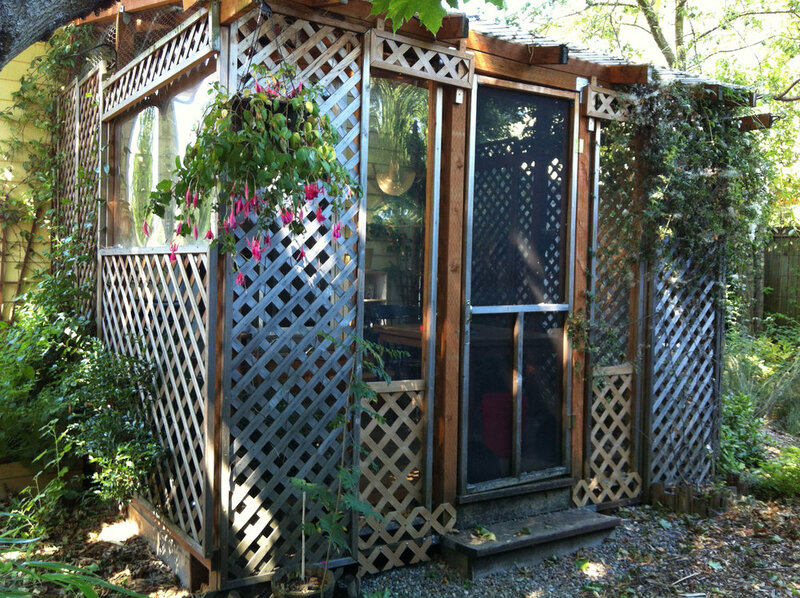 This Old House: Free DIY guide to create a screened-in window catio space. Includes step by step images, a cut list, tools and supply lists. DIY Portable Catio: Local handyman, Mike Peroni, created, built, and donated the portable catio you see us with at trade shows and posted on our facebook page! Here are the plans for that catio! Restore Habitat for Humanity, Portland: The Business Relations Manager at Portland's Restore made a catio out of found materials, then a lucky raffle winner took it home! Check it out! Habitat Haven has pre-designed cat enclosure kits, build your own enclosures, and a fancy RV series for kitty life on the road. Kittywalk enclosures has a variety of lawn, deck and patio designs to choose from. Kritter Kommunity has ‘kondos’ for kitty with little assembly required. Purrfect Catios features 3 DIY kits as well as custom design catios. Cats with an Altitude has developed window enclsures, called Kitty Peepers, which come in a few different sizes and can be quickly installed and removed. CD Pets has various enclosure kits to choose from as well as other indoor enrichment products. Support us & get your digital copy of any previous year Catio Tour Guidebook! Check out this album of photos and this video from OPB from the 2016 Catio Tour. View our Flickr photo album of Portland catios. Create your Catio Vision Board with example catios on Pinterest: here, here and here!